The first Franklin-Christoph I got was the Model 66. I got it with the ice body expressly to eye-dropper. However, the one pen I had my eye on was the Model 20 Marietta which was just being pre-released at the time that I discovered it and was only available in black. Still, I admired the Model 20 for its simple clean lines and the convenient slip cap. I liked the idea of a slip cap for quick access. But I really wanted to eye-dropper a pen with a translucent body so that's how I opted for an ice Model 66. 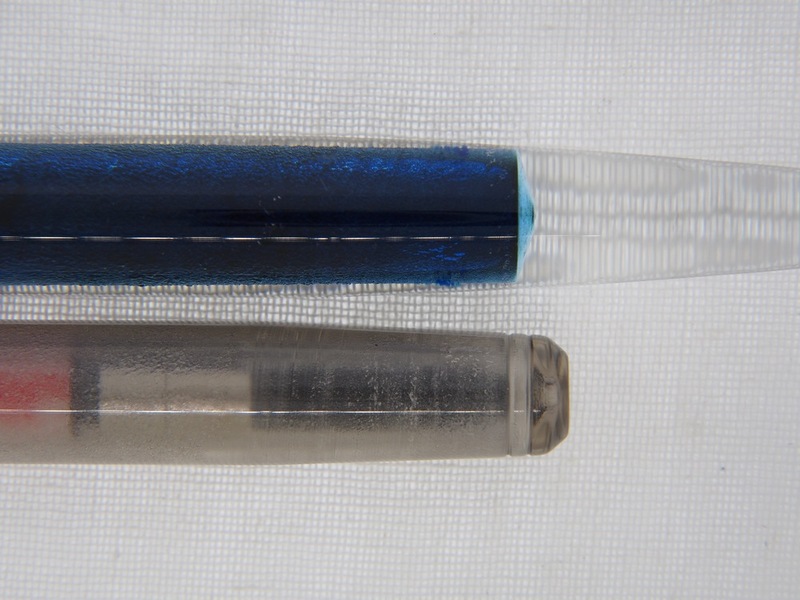 My second and third Franklin-Christoph pens were purchased at the same time from MassDrop: Pocket 40s in ice-blue violet and blue violet-ice. I love the portability of the Pocket 40. I gifted the ice-blue violet to my sister-in-law who is also a fountain pen aficionado. And so, I was left with 2 Franklin-Christophs. A couple weeks ago Wonderpens dropped hints that they were bringing in an exclusive Franklin-Christoph pen. I was so stoked that my favourite family-run Canadian pen shop was bringing Franklin-Christoph pens to Canada. When the Franklin-Christoph Model 20 in a dark, smokey Translucent Bronze was revealed I knew that I had to get it. I knew this one would be spectacular as an eye-dropper pen. I debated a bit on which nib to get. My Model 66 already has a Matsuyama Needlepoint. Both Models 66 and Pocket 40 use number 6 nibs so they would be interchangeable. I settled on something at the extreme wide end of the spectrum with the Music nib. Ultimately, I plan to swap the Music nib into the desk pen (Model 66) and put the needlepoint on the Model 20. I ordered the pen the same day it was released onto the Wonderpens website and got the pen in 3 days. As always, I got good, fast and friendly service from the fine folks at Wonderpens. I was pretty happy when I received the package. Now I'm up to 3 Franklin-Christophs again. The cap, section and body are made of the same translucent bronze material. The interior of the pen body has the stippling treatment that gives the frosted look. End caps on both ends are made of clear glass. The end cap on the slip cap is engraved with an 'F' and 4 diamonds. The slip cap is a marvel. There are no threads. It looks simple enough but it goes onto the pen body snugly and does not require effort to remove. It is the same with posting the cap. It just slips on and stays on. I never worry about it falling off or getting dislodged accidentally. The clip is small and silver coloured. It is adorned with an etching of 4 diamonds. 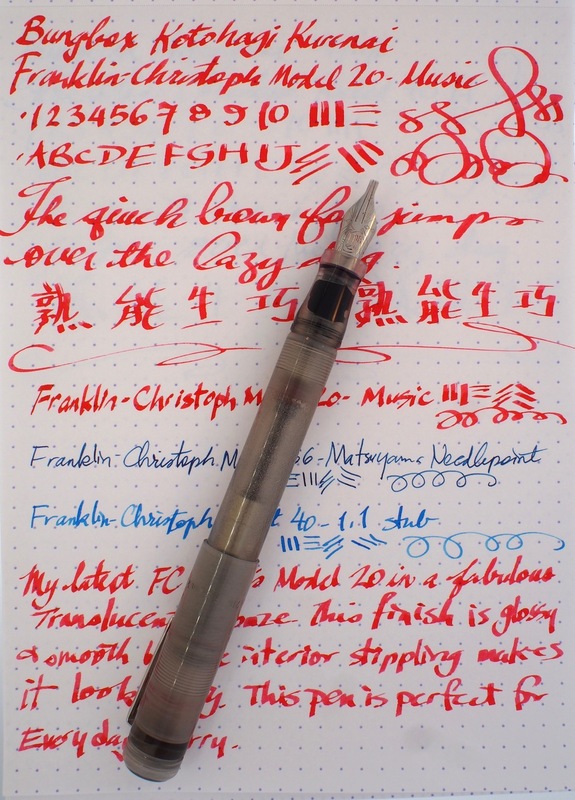 Just below the clip, the cap is engraved with the words 'Franklin-Christoph 20'. The pen is also available clipless. The section is about the same size as that on the Model 66 and it is slightly shorter than that on the Model 40. The shape of the section is similar to the Model 66, concave in the area where the fingers grip. But the shape is subtly different so that it feels 'fuller' on the Model 20. Overall, the pen shape has nice simple lines. The body is nicely proportioned for the length of the pen, neither too slim nor too chubby. I find the pen equally comfortable posted or unposted. Posting does make it ever-so-slightly back heavy. The music nib has performed perfectly right out of the box. The width gives nice line variation. This is the reason I wanted to go with the music nib. It's not so practical for note taking though but would be good for letters or creative lettering. The nib writes smoothly with a touch of toothiness. It is a stiff steel nib. I did not expect any 'flex' and there is none. The feed seems to keep up the flow of ink with my writing. I have not had any flow issues at all. No hard starts, skipping or railroading. Nib and feed are well-tuned. 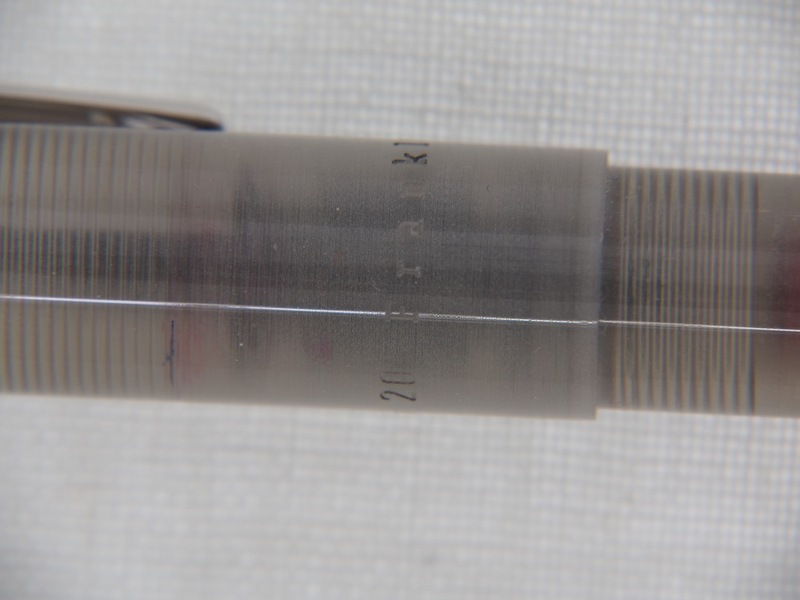 One thing that is different on Model 20 compared to 66 or Pocket 40 is that the nib is recessed into the section. Whereas where the nib enters the pen is flush with the top of the section on the others. I don't know why this is the case except perhaps to make the nib less protruding (that is, shorter). With the nib recessed, I find that some ink can be trapped in the 'well' in which the nib sits. I've found it hard to get the ink drops out so sometimes the ink spreads into the inside of the cap. It hasn't been a real mess so far but I'll have to keep an eye on this and see how I feel about it with more use. The fit and finish of this pen is perfect. Just consider the tight tolerances of the cap and body construction so that the cap can slip tightly on but not slip off accidentally. I think this pen is the perfect size to carry around for day-to-day use. After eye-dropper treatment, the ink capacity would be great and it will look beautiful. March 22, 2016 /Kate W.